Exquisite pair of lounge chairs by Jacques Adnet. Fully re-upholstered in new leather with pique sellier ( saddle stitching ). Base in original condition. 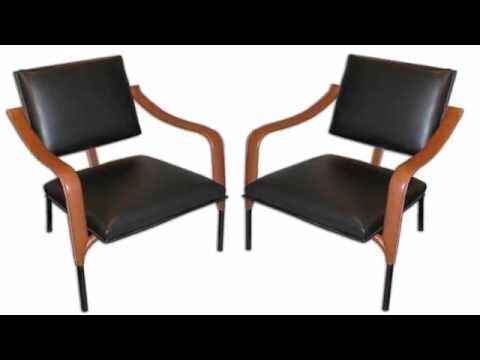 This pair comes from a set of 12 chairs found in a hotel in Paris. 2 pairs were in good condition, and 4 pairs needed to be fully reupholstered. The pair depicted has been completely refinished and reupholstered in beautiful brown and black leather with the exact stitching that Adnet used. The structure and the wooden frames of this chair are completely original. Images of chair in original condition available upon request. The set is coming from a large set of Jacques Adnet furniture which included 6 pairs of this model. In this set, only 2 pairs were usable as is. The other pairs absolutely needed to be repaired due to the fact that they had been stored in the hotel for 25 years and were extremely damaged. Provenance: Parisian hotel where we bought a very large number of chairs and tables by Adnet, all in original condition.